Staying Young With Qigong Massage? In Asia, many people keep fit doing Qigong. On a sunrise walk through a park in China, I watched a tiny and extremely aged woman and her friends doing their morning Qigong sessions. When she finished, she walked over to a tree and tossed one leg straight up the trunk in a full split like a 14 year old gymnast. Obviously her morning routine was working for her! Qi or vital life force energy permeates everything. And when it is flowing like a gentle river, all feels right with the world. But when Qi is stagnant or moves too fast, we feel imbalance. Organs suffer, the brain becomes foggy, muscles ache, and we feel older than we have to. Why does Qi imbalance sneak up on us? Injuries, poor food choices and lack of exercise are obvious triggers. But emotions like anger, fear, depression, grief, or stress also take up residence in muscles, joints, bones and organs. Over time, we become used to feeling dull, and our body reflects it. Ian brings Qigong skills from his martial arts background into his massage therapy practice. He understands how to manipulate and work with energy. Instead of pushing against blocks and tight areas, he guides the lodged energy to naturally shift and release with breath and movement. At times, he asked me to breathe out as he moved certain body parts. Some of the movements triggered old memories, hopefully releasing forever any emotional stress surrounding them. In other moments, I was completely blissed out in a happy zone. Similar to having an acupuncture treatment, Qigong uses intention and body movement to guide Qi into alignment, and massage uses physical pressure and body manipulation to do so from the outside. It's an internal-external approach, and the effects are long lasting. It heals not only the body, but the mind and spirit as well. When energy is flowing you do feel younger. To my happy surprise, I even looked younger when I got off the table. Alas, the one-hour 'facelift' faded after a while, but my body continued to feel flexible and free for weeks. I'll be going back again for a tune-up with Ian very soon! As you become more relaxed, your brain wave activity slows into what is called an alpha brain wave pattern. Alpha patterns vary from deep alpha, a state of deep relaxation often referred to as the twilight state between sleep and waking, to the higher end of alpha which is a more focused yet still very relaxed state. When you are absorbed in a good book (or a television show) you are probably in alpha. And, as I already mentioned, alpha is often associated with what is known as "superlearning"—the ability to learn, process, store and recall large amounts of information quickly and efficiently. Slower still are theta waves. Theta is best known as the brain wave state of dreaming sleep, but it is also associated with a number of other beneficial states, including increased creativity, some kinds of superlearning, increased memory abilities, and what are called integrative experiences (in which we make broadly-based positive changes in the way we see ourselves, others, or a certain life situation). "Ah-ha!" experiences, where you suddenly "get it," have an insight, or a great idea suddenly comes to you, are accompanied by bursts of theta waves in your brain. in this state might increase your effectiveness! Here's another exciting characteristic of the theta state: Dr. Thomas Budzynski, a noted researcher in this field, has said that critical and often self-sabotaging filters of the left brain are bypassed in a theta state, and that in terms of making positive changes in beliefs or habit patterns, "a lot of work gets done very quickly." And best of all, theta is also a state of tremendous stress relief. In the slower theta brain wave pattern, the brain makes lots of relaxing endorphins that really do—as you will see (or rather, feel) when you try it for yourself—melt your stress away. The slowest brain wave pattern is delta, the brain wave pattern of dreamless sleep. Generally people are asleep in delta, but there is evidence that it is possible to remain alert in this state—a very deep, trance-like, non-physical state you'll have to experience to appreciate. In certain delta frequencies the brain releases many highly beneficial substances, including human growth hormone, which we ordinarily make in decreasing quantities as we get older, resulting in many aging symptoms including loss of muscle tone, increased weight gain, loss of stamina, and many diseases associated with aging. reversed biological aging by as much a 20 years! But you can stimulate the production of this and other beneficial substances, easily and safely, by exposing yourself for a little while each day to our revolutionary Holosync® technology! Recent research performed by Dr. Vincent Giampapa, M.D., a prominent anti-aging researcher and past-president of the American Board of Anti-Aging Medicine, revealed that Holosync® dramatically affects production of three important hormones related to increased longevity, stress, and enhanced well-being: cortisol, DHEA, and melatonin. Cortisol is a hormone naturally produced by the adrenal glands. According to Dr. Giampapa, cortisol is the major age-accelerating hormone. It also interferes with learning and memory and is, in general, bad news for your health and your well-being. Cortisol is the "stress hormone," and the more of it you have, the more stressed you feel...the more susceptible to disease you are and the faster you age! Another hormone, DHEA, is also produced by your adrenal glands. DHEA is a precursor, or source ingredient, to virtually every hormone your body needs. DHEA level is a key determinant of physiological age and resistance to disease. When levels are low, you're more susceptible to aging and disease; when they're high, the body is at its peak—vibrant, healthy, and able to combat disease effectively. The third hormone we tested was melatonin. Melatonin, everyone knows, is a hormone that helps to create restful sleep. We make less of it as we age, and since during sleep many important rejuvenating substances are created in the brain, the inability to sleep soundly can dramatically decrease the quality of your life and greatly accelerate the aging process. New research also reveals that it is a powerful antioxidant. In fact, it is even more powerful than Vitamin E.
In just three days, over 68% had increases in DHEA levels, with an average increase of 43.77%. Several people had increases of 50, 60, even 90%. Cortisol, on the other hand, was down an average of 46.47%, with positive changes in 68% of the people, and with several people having decreases of 70 or 80%. Melatonin levels increased an average of 97.77%, with positive changes happening in over 73% of the people. Many had improvements of 100, 200, even 300%. ...increases both well-being and longevity! Try a Migun Massage and you will get to try this amazing sound technology as part of the treatment. Only $20 for 30 minutes! Book yours today! Winter Got You Down? Head For Your Kitchen! By now you know how passionate I am about my 21 Day Cleanse Program. It's the real deal and I want you to join me. Our next group cleanse is coming up on Wed January 16th. We want you to commit to your health this year and put yourself first... everything else tends to improve as well when you do. Every year I am excited by the amount of people who are interested in clean eating/living as a New Year's resolution. There is a perfect time to get on track and start the year off right. I support you in this and would like to offer you a special incentive to jump on board with your own health and wellness. Commit to the 21 Day Cleanse Program before January 10 and get $50 off! When you consider the materials included (manual, cleanse powder and packets, online access, live Q and A feed, discounted consults, online resources access), you will see I am GIVING this program away. If you're not local you're in luck. The entire program is available online. Once you register, you will have access to the classes and materials-- we walk you through the entire program as if you were sitting in the group! Love technology these days. Winter Got You Feeling Down? Your Kitchen Has The Answers. This is my favorite time of year. I feel a sense of relief, the busy days of summer are over. It is time to come indoors, reflect on the past year and create a warm, comforting environment. Not everyone shares my love of fall and winter- shorter/ darker days, less activity, less sun and the holidays right around the corner, many people experience low mood, weight gain/loss and disrupted sleep. Guess what- nature has provided some great solutions. I find it fascinating that the root vegetables are in season this time of year. Root vegetables like parsnips, beets, and sweet potatoes contain nutrient rich starches which help the body to produce its calming, anti-depressant neurotransmitter, serotonin. Another fall/winter food which helps relieve anxiety, depression and insomnia are pumpkin seeds! Pumpkin seeds are a powerhouse of protein, healthy fats and nutrients, like zinc. Not only will they help alleviate depression, they can help with high blood pressure and arthritis. Pumpkin seeds are high in tryptophan, the amino acid precursor to serotonin. Combined with high levels of zinc (zinc is a key component of neuronal brain health). This time of year I start to crave warming foods and spices-- chai or yogi tea anyone? What a perfect food for this time of year-- these spices keep the blood moving and provide necessary antioxidants to prevent colds and flu. Here are two of my favorite warming winter drinks. Bring water, spices, and ginger root to a boil in a pot. Lower heat and simmer for 15 – 20 minutes. Add milk. Turn off heat and strain into mugs. Add sweetener if desired. And here is a link to Mark's Turmeric Tea: This is very good! In my practice, for those who are prone to Seasonal Affective Disorder, I will make sure their vitamin D levels are measured and supplemented to the optimal health range, a light box (even in a temperate climate) is important, supplemental precursors to serotonin like Tryptophan and 5HTP, the B-vitamins in their bio-available forms (particularly B-6 and P-5-P and adaptogens (herbs that help with stress--who doesn't need these? )- one of my favorites is rhodiola. During medical school in Seattle (very dark, short days and high stress), we commonly referred to rhodiola as "sunshine in a bottle"! The word cleanse is a buzz word. We hear it in the media from celebrities like Gwyneth Paltrow and Beyonce. The word invokes images of juices, powdered concoctions and frequent trips to the bathroom. For some it seems ridiculous- why torture yourself? For others, it seems glamorous- like a sure fired quick fix when you need weight loss and clear skin for a red carpet event. But what is a cleanse…really? And who needs a cleanse…really? The reason the word *cleanse* conjures up so many different images is there isn’t a unified definition of a cleanse. People promote whole body cleanses, bowel cleanses, juice cleanses, raw foods only, and water cleanses. One of my professors used to say, a cleanse is different for everyone, depending on where they are in their health journey. For one of his patients, an older gentleman without much regard to his health at all, a cleanse meant stopping the nightly box of Oreos and starting to walk 2 times per week. All of this variety leaves the public confused about whether they need a cleanse. In my practice, a cleanse is a concerted effort to eat and live in a way that supports health and vitality. It is about making conscious choices and being aware of how the foods, activities and environmental exposures affect every aspect of your health. It is about learning how to eat clean, unprocessed foods and eliminate inflammatory foods that cause vague symptoms like, fatigue, headaches, gas/ bloat, weight gain, allergies and skin issues. It is a learning process- food affects every aspect health. Each one of us needs a cleanse because each one of us carries a body burden load. Body burden or toxic burden is the term scientists give to measure the amount of environmental chemicals found in the body. With increasingly high levels of daily chemical exposure, from the air we breathe, the food we eat, the water we drink and the chemicals we put on our skin, everyone has a body burden. As far as you can get from your body burden, or toxic load, the better you will feel. A cleanse is about learning ways to reduce your body burden, creating a new and lasting level of health. I recommend a cleanse, like the one I have described, at the change of each season, ideally 4 times per year. We all get off track and this is a great way to help you re-focus and re-establish your health goals. Remember, a cleanse does not have to be extreme and it definitely does not have to be a “celebrity fad” diet. Choose a cleanse that has been around while, time tested with exciting testimonials. Make sure the cleanse offers support and guidance throughout and make sure it is something that makes sense to you. After all, you want to be healthy for a lifetime, not just for a red-carpet event! Mark your calendar for our next in-house cleanse. Sept 26 6pm (3 consecutive Wed nights) $345. Sign up by Aug 30 and recieve $50 off! Call 843-725-0217 or email wellness@seekingindigo.com for more details. Ellen Watson, staff member for over 25 years at the Esalen® Institute in Big Sur, California, brings Esalen® Massage to Seeking Indigo. 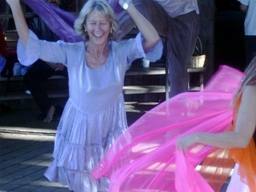 It is a healing art evolved over 45 years at the Esalen® Institute. Esalen® Massage works with gentle rocking of the body, passive joint exercises and deep structural work on the muscles and joints, together with an energetic balancing of the body. August 1st to August 4th. Herbs have been used since the beginning of humanity because of their effective therapeutic value. What was once a practice based on empirical observation has in the last century transformed into the sharp edged double blind placebo based paradigm accepted by the scientific community. As a result two things have happened regarding herbs in our culture (the World Health Organization estimates that more than 80 percent of the world’s population still uses herbal medicine as a primary system of healing): What our ancestors as close as our grandmothers knew about home health remedies has faded, while at the same time an idea of using natural, non toxic extracted substances emerged in the form of vitamins and supplements. Herbs and medicinal foods can effectively treat a myriad of symptoms. Our health is not outside our own grasp, it’s in our own garden. Whether we use turmeric as an anti inflammatory, artichoke or the pectin from apples to lower cholesterol, eggplant to lower blood pressure, or green tea, blueberries and pomegranate for their antioxidant properties benefiting heart health and increasing lifespan, or countless other herbs and foods to improve our health, it is an empowering process to grow and utilize our own medicine. Even the simple weeds we remove from our garden are useful. Dandelion for example is very good for liver and kidney health, helps remove water weight without affecting potassium levels, which is crucial for heart health, and helps regulate blood pressure. Plantain is used topically for any type of cut or wound to help disinfect. Because modern medicine often attempts to validate what our ancestors knew about the medicinal power of plants, most herbs that are used today medicinally have been researched for their pharmacological effects. Astragalus has been used for thousands of years to treat all kinds of prolapse, asthma, and to strengthen the immune system. Research has more recently shown it to be an immuno-stimulant, a preventative herb for asthma and cough and helpful for gastric and rectal prolapse. There are hundreds of amazing books on medicinal herbs and foods, but we really like “Family Herbal” by Rosemary Gladstar, “Prescription for Nutritional Healing” by Bach & Bach, and “Healing with Whole Foods” by Paul Pitchford. The active statin in red yeast rice extract that is used in major pharmaceuticals was patented and there was a successful lobby made to illegalize the manipulation of the natural state of red yeast rice to increase the amount of the naturally occurring “lovastatin” that has been proven to lower LDL cholesterol. Because every harvest of red yeast rice is volatile, you cannot standardize the production of it to have a naturally occurring effective level of lovastatin. It becomes very costly and timely to have a red yeast rice product that consistently has the amount of lovastatin needed to efficaciously lower cholesterol. Buy red yeast rice from companies that have in house lab testing, ensuring each batch has the appropriate levels. Most of the consumer grade multi-vitamins come in pill form making it difficult for your digestive tract to break them down for your body to utilize the active ingredients. Often people pass the whole pill in their bowel movement. For many vitamins it is better to have them in a powder form in a vegetable capsule. EFA's (essential fatty acids) are readily available anywhere you go. And rightfully so, omegas balance hormones and mood swings, regulate skin conditions, reduces hair loss, regulate metabolism, support healthy blood sugar/glucose levels, promote healthy body weight and fat metabolism, promote healthy triglycerides levels, lubricate joints and reduce chronic inflammation. The fish oils that you commonly buy in big stores, however, have little to no Omega 3's. Fish oils need to come from a cold water arctic source. If you buy cheaper fish oils you're likely buying a product that is actually more toxic for you than it is beneficial. Research the companies and spend the money on higher quality. Dr. Judas Folkman, who first recognized angiogenesis (blood supply) as an important component of cancer had a long and hard battle convincing the rest of the medical world of his ideas, but eventually he won a Nobel Prize for his work. The herbs curcumin and green tea are having equal resistance placed upon them but research is showing that they play a large part in the inhibition of cancer via angiogenesis. This is the process. We slowly learn and research. The empirical science of herbs developed in this way for tens of thousands of years, and supplements serve as a sturdy bridge between the western medical mindset and ancient herbal wisdom. Zachari Cahn L.Ac. M.A.O.M. and Tatianna Sanabria L.Ac. M.A.O.M. are Licensed Acupuncturists & Herbalists with Masters in Acupuncture & Oriental Medicine (M.A.O.M) available at Seeking Indigo. Stop by and visit our remedy market, the newest addition to Seeking Indigo, where you can have an herbal remedy custom blended specifically for YOU! Please call 843.725.0217 to make an appointment for acupuncture or stop by Sundays from 12-4pm or Mondays 10am-6pm for a consultation. "Live with intention. Walk to the edge. Listen hard. Practice wellness. Play with abandon. Laugh. Choose with no regret. Appreciate your friends. Continue to learn. Do what you love. What Is Your Body Burden? Body Burden is a term scientists give to measure the amount of environmental chemicals found in the body. With increasingly high levels of daily chemical exposure, from the air we breathe, the food we eat, the water we drink and the chemicals we put on our skin, everyone has a body burden. Some of the symptoms of an excess body burden include the inability to lose weight, fatigue, joint/muscle pain, insomnia, depression, digestive issues, allergies and headaches. Did you know there are currently 80,000 common chemicals used in industry today and only 200 have been tested for safety? Women are particularly vulnerable to chemical exposures because they tend to carry more body fat (toxins are stored in body fat) and they need to maintain a delicate balance of hormones each month. Many of the environmental chemicals used today are known as hormone disruptors. They have been implicated in many of the female issues that have become ever present in our society. Infertility, menopausal symptoms, endometriosis, female cancers, precocious puberty and weight gain are all on the rise. Now more than ever, it is imperative that each person takes responsibility for managing their own level of chemical exposures. There are simple daily techniques you can use to dramatically reduce your exposure to environmental chemicals. o Read Labels! If you can’t pronounce it..don’t eat it. If it has more than 5 ingredients, don’t buy it. o Use Natural Skin products. Your skin is the largest organ of detoxification...help the skin do its job by not adding chemical based products from cosmetics, lotions and fragrances. *A balanced cleanse program is one that is easy to follow, addresses all the organs of elimination and reduces the total body burden. A good cleanse program should be gentle enough to incorporate most aspects into your daily life. 2 Spots left in our 21 Day Metabolic Cleanse starting April 27th. After the tragedy in Japan, everyone is talking about radiation expsoure and what to do in case radiation makes its way to the US. While I am not ready to comment on using Potassium Iodide- I don't believe we have enough information at this point and there are potential side effects with the high doses recommended - I would like to comment on dietary ways you can keep yourself safe. We are often looking at radiation exposure during cancer treatment and ways we can help people recover more quickly. Here are some safe and effective suggestions. Side effects include improved overall health! *Eat your sea veggies- nori, wakame, kombu, etc. It wasn’t long ago that coconut oil was vilified for its high saturated fat content. The public was made to believe this food would cause high cholesterol, clog the arteries and increase body fat. 1. Coconut oil is a medium chain triglyceride. It is metabolized very differently than other fats in the body. It is quickly absorbed, provides quick energy and promotes healthy digestion. 2. Coconut oil has a very high heat point, meaning it will not change structure in the presence of heat. This is a great anti-aging benefit since we believe the oxidation of fatty acids leads to inflammation and inflammation leads to premature aging. 3. Every cell in our body is made of a bi-lipid fatty membrane. In order for those membranes to stay healthy, they need a certain amount of healthy fats, and that includes the medium chain fat from coconut oil. 4. Medium chain fatty acids are a key component of mother’s breast milk, a perfect food for growing healthy brain neurons. 5. It also works great topically, as a moisturizer and a make-up remover. Just like we have to pay attention to what we put into our bodies, we have to pay attention to what we put on our skin. I cannot think of a safer, more natural way to moisturize the skin than with coconut oil! Stop by Seeking Indigo to pick up yours today ..... from our Bright Earth Natural Living Foods line. Qigong Meditation This Coming Thursday! Qigong Moving Meditation this Thursday Night! Join us this coming Thursday, March 10th at 6:30 pm for one hour of qigong moving meditation. Qigong is an ancient Chinese system of healing designed to clear energy blockages and release negativity. The process is liberating, fun, and purifying - intuitive self-expression to free the stress of a busy day. If you're in the area, COME! Mark Your Calendar: Seldar Returns! The weekend of April 16th, Seldar Antonov returns to Charleston for a weekend of discovery, self-realization and inquiry. Literally able to see within our individual cells, Seldar will be back to explore everything from personality types to disease, from universal connectedness to 2012. You're invited to join! On Saturday, April 16th at 7pm, Seldar will host a $10 introductory lecture for all of us seekers. Seldar is a gifted healer, able to shift DNA with his thoughts to re-create a new, living experience to lift you out of your pain and suffering. He is here not just for healing but for insight - a fresh perspective on changes underway in the natural world that will have profound consequence on our being. More information to come, but there's limited availability and we encourage you to do what we do - and join us for all. Seldar's extending a generous offer by including a group healing session with each workshop, and $120 covers Friday night lecture, the group session Saturday night and Sunday workshops - that's all 3 modules. PEMF therapy is great for just about anyone seeking pain relief, greater recovery/range of motion or freedom from heavy addictions. The list of those who benefit is quite literally ... endless. Pulsed Electromagnetic Field (PEMF) Therapy is like a battery charger for the cells. As deficient cells are exposed to the pulsed energy, they constrict - forcing toxins out and drawing the much-needed energy in. Cells that need the energy know so, and draw it in automatically. PEMF is a quick, affordable and effective way to recharge your cells, rebalance your system and boost your metabolism. PEMF Therapy is great for everything from chronic pain relief to anti-aging by the nature of what it does; as cells lose energy, performance suffers and we age prematurely, with the potential to develop degenerative dis-ease. PEMF Therapy is fast, gentle, effective and affordable. There are no side effects. It feels good! Seeking Indigo and practitioner June Johns are thrilled to make PEMF Therapy available to our clients. Book an initial session with June ($125) to explore and experience this healing modality for yourself. I have this to say about the many common mental-emotional conditions, today, like depression and anxiety. 'If your mood persists and doesn't go away, it originates in your biochemistry.' Take a moment to think on that statement. I am not saying here that anxiety and depression exist only in our biochemistry by any stretch; they have a very real and consuming presence in our minds. However, if no amount of mental work can bring true and long-standing relief, you must seek to rebalance your neurotransmitters and hormones to find emotional peace. The fleeting successes of current treatment models should point to the fact that we're missing something. One thought is that it seems like punishment to ask a person suffering through major depression to talk his/her way out of it. We find they become experts at discussing their problems with therapists who at times seem like very qualified strangers. The depressed individual might become an expert in the vague and circuitous language that their therapists use but rarely is there ever any true healing. Any relief is often only short-lived. The dysfunctional biochemistry is the driving force of the emotions and is relatively untouched by talk therapy. The realization that their emotional lability is rooted in their biochemistry and not in their mind offers many a sense of relief and hope. They have not failed in the past; the treatments have and with the right biochemistry, relief is possible. Our moods regularly wax and wane... week-to-week, day-to-day, even moment-to-moment. It is the nature of the human experience for our emotional pendulum to freely swing from joy to sadness to hope to despair to happiness to anger and on, but never to linger too long in any emotion, or swing to the extremes as in major depression. If it does, it is likely biochemical in nature ie physical, not mental. Your biochemistry is affecting your pattern of thoughts. Let us take anxiety, as an example. Anxiety will come and go as a healthy and normal response to our stressful lives; it should not, however, persist without reasonable cause. The freefall anxiety of a panic attack is driven by a failure at the biochemical level. The basis of the most prevalent pharmaceutical intervention for anxiety is to affect the biochemical nature of your anxiety with a patentable substance, like a benzodiazepine, that mimics the role of a natural substance in your body, GABA. To be clear, you don't have a benzodiazepine deficiency but rather the drug targets your biochemistry and acts to promote the effects of GABA in your body. The benzodiazepine is a poor imposter of your natural biochemistry and is heavy-handed in its effects and side effects. Inherent in the pharmaceutical approach, however, is the knowledge that the anxiety has a biochemical cause and cure but I ask why not use a more natural approach. Why not get to the cause of your anxiety. You have followed conventional wisdom; it has offered only minimal results, but you have hope now. The human frame needs balance at all levels of body, mind and spirit. Too often, only one is addressed and therefore the system will always deviate towards imbalance. Seek out a qualified holistic nutritionist to help you balance your neurotransmitters and hormones and your efforts will bear fruit. You will experience the renewed spirit and vitality that you seek. Darshan is a Sanskrit word meaning "sight" or "vision", but actually receiving Darshan is hard to explain. It is an interaction which focuses and calls out the consciousness of the receiver, with the heightening of consciousness or spirituality as the intended effect. You must experience it for yourself. Join us Saturday for a glimpse of the Divine and the Grace. This spiritual "blessing," of sorts allows the Light of God into the soul. Rose Marie transmits Darshan when she is in a state of Samadhi or unity consciousness, at one with Spirit. Darshan affects you in many ways. Your life can be seen as a thread with Karmic knots or ties. As she gives Darshan, Rose Marie is able to loosen or untie these karmic knots (stresses) - easing your life. Darshan cannot be intellectualized. It is to be experienced, and its effects work on many levels. It is always perfect and exactly what you need at the time it is given. Darshan fuels your spiritual evolution and expands your awareness and consciousness. To prepare for Darshan, dress comfortably and be in a receptive state. You may experience Darshan differently each time. Receiving Darshan more than once has a cumulative effect. Expect to spend one to two hours, depending on the size of the group. Each individual will have the opportunity to sit in front of Rose Marie, be touched by her, and receive Darshan. Also of interest, frequently, Spirit will give a discourse through Rose Marie at some point during the evening. Scheduled to visit Charleston the weekend of January 14th, Seldar Atamov has the gift of reading the energy of your DNA. His gift is his ability to reconfigure degenerative cells and to recreate a new experience that lifts you out of pain and suffering. Simply, Seldar can experience your disease, on all levels: emotional, mental, physical, spiritual, and intuitive. His approach is soft and gentle. He affirms and inspires our own healing through movement of energy. This is an experience that exists beyond the realm of the written or spoken word. Register for a Weekend with Seldar by calling Seeking Indigo at (843)725-0217. On Friday, January 14th, we officially welcome SELDAR to Charleston and into Seeking Indigo for the first time. Seldar, a gifted healer who found us after our weekend with Trivedi, has the gift of reading the energy of your DNA. Join us for a Friday night group experience, during which Seldar will introduce you to his gift and explain its implications for you, and for all of humanity. Seldar has a gift of reading the energy of your DNA. His gift is his ability to reconfigure degenerative cells and to recreate a new experience that lifts you out of pain and suffering. Simply, Seldar can experience your disease on all levels: emotional, mental, physical, spiritual, and intuitive. You are invited to experience greater well-being and improved health. Seldar shares what he believes is his gift, how he uses this natural ability and explains the science of DNA. Sense and learn how "we are all one - we are creation." Seldar talks about his experiences throughout his years of doing this blessed work. $20, at Seeking Indigo. Email info@seekingindigo.com to reserve. A full day of individual sessions with Seldar. Through discussion, intuition, and gentle, safe, hands-on therapy, Seldar senses your DNA that has been out of balance; then adjusts your DNA to create a new experience. Truly a unique opportunity to heal any area of your life. $150 per session, at Seeking Indigo. Email info@seekingindigo to reserve. Seldar will facilitate an all-day, creative workshop exploring hormone cycles and the personality. Topics include: The Energy of DNA, The Nature of Disease, The Hormonal Cycle. Time allotted for discussion, questions and answers. in our last wellness sampler of the year! You're invited to join us for a holiday wellness sampler on Thursday, Dec 16th. We will be featuring Gregg Steinberger, a visiting practitioner from Asheville, and our in-house practitioners during a night that you will not forget. Makes a perfect holiday gift ... and is a great way to get in gear for a New Year's resolution that you'll want to keep. The sampler is a fun-filled night designed to expose you to Seeking Indigo's world of wellness. 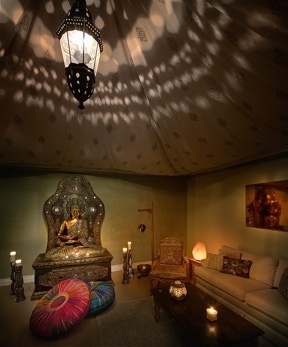 You'll spend 3 hours in zen paradise, sampling everything from Thai Massage to Tarot - and at the end of the night, enjoy taking $30 off the service of your choice. And you're his audience! Get a taste for his Thai at the sampler and enjoy applying your $30 to a service with him the following week if you'd like. & so much more! Call (843)725-0217 to reserve your $30 spot today! This fall, Seeking Indigo's Center for Awakening has been blessed to receive one of the world's most conscious Lightworkers and spiritual teachers. Next Tuesday, November 16, Seeking Indigo welcome internationally acclaimed spiritual teacher, Mirabai Devi, for an intimate gathering in our Wellness Center. Spend an evening with Mirabai to experience the process of accelerated transformational healing through her Light transmission. The evening will begin with a short meditation followed by a group question and answer session. Mirabai will then conduct a group Light transmission which provides spiritual activation and healing. Followed by individual healing sessions with members of the group. The light works on your DNA to release all negative trauma and karma to miraculously heal the physical, emotional and spiritual bodies. Thousands of miracles have occurred in people all over the world who have participated in these individual and group healing transmissions. Energy Clearing to open up new possibility and allow abundance to flow in! Celebrating traditions and rituals from afar is what sets Seeking Indigo apart from the rest. To honor the summer solstice, and to invite the new and exciting changes taking place at Seeking Indigo, we created a tradition of our own. On Monday, at 6 pm, our friends Heather Howell and Erica Girth conducted a space clearing ceremony at Seeking Indigo to sanctify the many sacred structures in our space, and to open our vortex for the amazing opportunities ahead. Monday night at 6pm the magic began! Our space carries such profound energy - home to so many passions, and hearts and strong will. You know like we do how important it is to keep up with the clutter. To clear the bad energy. To welcome the new. Come see, or feel for yourself! We encourage our team and our readers to take a moment today: tap into your divine self and and give gratitude for all that you have in your life. We at Seeking Indigo are so very fortunate to have such an amazing space! Thank you for your continued support and love for what we are all co-creating! c.h.o.i.c.e. alliance is a global community of individuals and organizations supporting each other in growth, education, creativity, and marketing in order to effectively provide goods and services aimed toward raising the vibrations of health, well being, conscious choice, personal development and empowerment of all peoples. Seeking Indigo is featured in the Spring 2010 Member Spotlight. Download the Profile here. C.H.O.I.C.E. Alliance is part of Believe... Choices for Conscious Living, a life-enhancement center. On May 27, Seeking Indigo celebrates the much awaited arrival of Marie Nilsson, Swedish mechanical/electronic engineer turned healer as part of our Thursday night sampler! If you can't make the sampler, Marie, who wrote the The Magic Power of Stones, Crystals and Minerals will also be in Charleston at Seeking Indigo for a one-night-only workshop for practitioners interested in learning the fine art of chakra balancing and aura cleansing using stones and crystals. Learn how energy works, how the electrons can act, understand frequencies, and why hard rocks and crystals can be used as healing tools in a 2 hour workshop that Marie will be holding at Seeking Indigo on Tuesday June 1 from 6 - 8pm. Open to practitioners and the general public. Cost $35. Class limited to 20 participants so sign up today. This is one workshop you will not want to miss. Call 843-725-0217 to reserve your spot. The Perfect birthday gift from Seeking Indigo - Give a years worth of Japanese Facelift Massages! It's the Gift that keeps on giving month after month for an entire year. This is your chance to take someone's breath away by treating them to a years worth of Japanese Facial Massages. Each month your loved one will receive a Japanese Facelift massage by internationally trained expert Elizabeth Shealy. This treatment alone will leave her feeling like a queen. It will leave her skin luminous, radiant, and youthful. She will receive a facial as well as a face neck head and foot massage Japanese style. She will certainly rave about her experience for months to come. When you buy 10 you will receive 2 free - save a total of $270 for the series of 12. Each month you will be charged $135 and your special loved one will receive her gift certificate for that months facelift massage. What better way to show your appreciation for that special someone. With each day that passes at Seeking Indigo, we are reminded of the amazing power of this vision. We are inspired to push harder, reflect more and, in the midst of our creation bliss, stop and remember that the power of Seeking Indigo is not in just one of us; it is all. From our staff to our business colleagues to our amazing customers. We give tours of our Wellness Center every day. Behind the ancient hand-carved Indonesian wooden doors lies a vast space brimming with health and wellness. It was the last tour of the day. A lady asked if she could be escorted back to see what was behind the doors, and I gladly agreed. The doors opened, we stepped inside and all of a sudden she stopped. She turned and quickly walked out. At first I was a little miffed by what was happening, but then I could see she was searching a bit frantically for her significant other. She grabbed his hand and dragged him to me. We entered the space again, and with wide eyes he said, "Wow, this is amazing.. it is so beautiful." She turns to both of us and replied, "Yes it is, but I want you to close your eyes. I don't want you to look at it. I want you to breathe it in and FEEL the space." At that moment I closed my eyes with the strangers and stood there for a long time. It felt incredible to breathe in this creation that each and every one of you have contributed to, just by walking in and revering the space. It is powerful. It is healing. It is magical and the only reason is because we give it meaning. We are so grateful for each one that walks in door and experiences Seeking Indigo--not just sees it or buys something but really takes an experience home with them to share with others. We are thankful and humbled that our Wellness Center is powerful and moves people just walking in the door. Magical. Have you ever wanted to know everything? Have you ever wanted to know the secrets of the universe? What if it was possible to read and retain every major work in history, be it literature, science, politics, religion etc.? What if you had the capacity and concentration to practice and master methods to traverse all of the states of consciousness: gross, subtle, causal, and non-dual? What if you could take all of that knowledge and all of that invaluable experience and integrate it into a system of understanding that you could then teach to others in an effort to uplift the universe? Sounds like a daughting task, huh? Well it's a good thing that the Zen master and genius Ken Wilber has done all of that for you. Check out his book “The Integral Vision" for a great introduction to his Theory of Everything, which might just reinvigorate your journey to wake up. World renowned Singing Bowl Artist Jay Schwed will be at Seeking Indigo May 6 and 7. Jay will perform in conjunction with our Thursday night sampler!!! Come to experience a sneak peak at the healing sounds and frequencies of crystal singing bowls, whose sound and vibration promote healing within the body. Limited to 20 guests; sign up now as these spots will go fast! Cost $50. Jay will also perform a live concert at Seeking Indigo 7 - 9pm. Feel the sound, experience aromatherapy, a dolphin meditation and the intuitive connection to your own angels. Tickets are $20 in advance for the concert. Jay will perform as the kick off of a new 6 week series of morning yoga sessions at Seeking Indigo. A variety of different yoga modalities will take place every Friday morning under the instruction of a different practioner. This is one opportunity to work with Charleston's top yoga instructors and try out new forms of yoga you may not have experienced before. Space is limited so sign up in advance. Jay will be performing the first of this series in front of the harbor downtown while dolphin frolic to the amazing sounds of his crystal singing bowls. During the 6 week program, participants will receive gentle corrections and aromotherapy will be part of this amazing mind/body/spirit experience. 6 week series is $120 and every week will be hosted at a different location integrating the beautiful nature and most hidden gems of Charleston's own backyard.